Andre Saldivar, project manager at SCE’s Foodservice Technology Center, inserts a probe into a cup of soft serve ice cream to ensure it maintains a temperature of 21 degrees or less. An engineer at the SCE Foodservice Technology Center test kitchen uses the clock on his cell phone to make sure each cup of soft serve ice cream is filled for exactly 40 seconds. A flat screen monitor in the SCE Foodservice Technology Center provides a digital readout of the energy usage of a soft serve ice cream maker during a test. A temperature probe is inserted in a cup of soft serve ice cream to ensure it is 21 degrees or colder during a test at SCE’s Foodservice Technology Center. SCE’s Foodservice Technology Center showcases the latest in energy-efficient appliances while educating the food industry. Clad in white lab coats and blue latex gloves, the three engineers and two assistants run the test with military precision. One engineer turns on the spigot, filling a clear glass cup with vanilla soft serve ice cream for exactly 40 seconds. He hands it to another engineer who weighs it, then a third engineer inserts a probe to ensure the temperature is 21 degrees or colder. Each measurement is duly recorded. The test runs flawlessly. The thick swirls of soft serve beckon, but eating will have to come later. The team must repeat the test 29 more times back-to-back. And then they will do the entire process again three more times — 30 consecutive servings, 40 seconds each, temperature below 21 degrees. 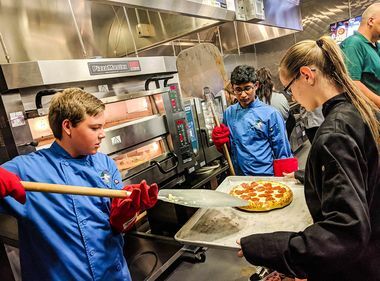 SCE created the center 25 years ago in an effort to educate restaurants, schools, grocers and others in the food industry about energy efficiency. Increasing energy efficiency is a win-win situation for customers, who save on their electric bills, and SCE, which sees reduced demand on the power grid. “Foodservice is everywhere and it’s a big energy guzzler in SCE’s territory, that’s why we pay attention to it,” Saldivar said. Saldivar’s team provides a variety of services to the food industry, all for free. 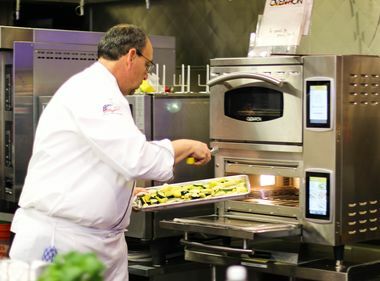 They have tested equipment ranging from the soft serve machines to pizza conveyor belts and pressure fryers for chicken to determine which ones meet energy-efficiency standards and qualify for possible rebates. They also visit restaurants and other food establishments to do on-site energy audits. 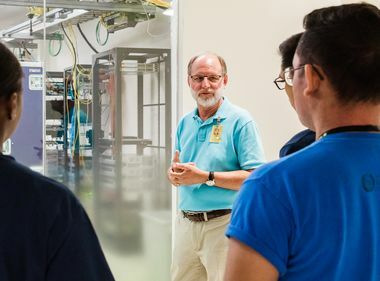 Last year, Saldivar’s team worked with customers as varied as McDonald’s, Kroger markets, Starbucks and 85C Bakery, advising them on energy-efficient equipment that saved them a combined 1.6 million kilowatt-hours on their annual electric bills. That’s enough to power 300 to 600 homes for a year. 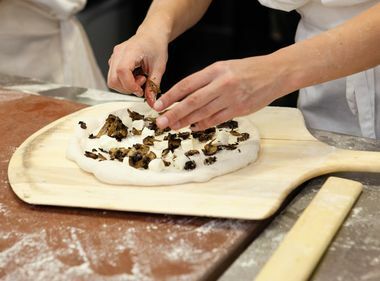 The kitchen, located in an SCE office park in Irwindale, also is available for customers to test their recipes on various pieces of equipment. Bravo TV Top Chef Michael Voltaggio visited recently to use the center’s equipment to test the entire menu for a new sandwich shop franchise based on his ink.sack restaurants. Saldivar acknowledged his is an unusual job for a utility. He said the best part about the job is having a different challenge every day. And, of course, when the testing is over, there are the leftovers.